Artist and photographer John Frost was born 21 May 1923 in Pasadena, California. John and his wife Joan Frost, an author, lived for more than forty years in Jocotepec, before returning to California in 2012. John became interested in photography and the magic of the darkroom at age 14. He attended Midland School, a small boarding school near Los Olivos, California, and later earned a degree in Graphic Art following military service in the Pacific during the second world war and then settled into artistic and commercial photography in the mid-1950s. John’s first solo exhibition, of mixed media pieces, in which drawings were photographed, enlarged and chemically treated to transform colors, was in Bobinart Gallary in Los Angeles in the early 1960s. This exhibition moved to Purdue University in 1966, shortly after Frost had relocated to Jocotepec with his wife. At Purdue, the opening of the exhibit was accompanied by a lecture about the “beat generation”. At the time, Purdue was embroiled in a bitter city versus university battle, on account of the Police Chief having ordered the university library to withdraw from circulation all books by Henry Miller, the American author then living in France. John Frost (then 41 years old) married Joan Van Every (35) on 26 September 1964 in San Bernadino, California. In 1966, the couple relocated to Mexico, living for a short time in Uruapan in Michoacán before establishing their permanent home and photographic studio in Jocotepec. In 1968, an exhibition of his silkscreens at La Galería in Guadalajara prior to the 1968 Olympics attracted the attention of TV broadcasters. Frost declined to give them permission to film his silkscreens since they asked him for $200 towards the production costs! In May 1971, Frost was among the large group of artists exhibiting at “Fiesta de Arte” at a private home in Ajijic. Other artists showing there included Daphne Aluta; Mario Aluta; Beth Avary; Charles Blodgett; Antonio Cárdenas; Alan Davoll; Alice de Boton; Robert de Boton; Tom Faloon; Dorothy Goldner; Burt Hawley; Peter Huf; Eunice (Hunt) Huf; Lona Isoard; Michael Heinichen; John Maybra Kilpatrick; Gail Michael; Bert Miller; Robert Neathery; John K. Peterson; Stuart Phillips; Hudson Rose; Mary Rose; Jesús Santana; Walt Shou; Frances Showalter; Sloane; Eleanor Smart; Robert Snodgrass; and Agustín Velarde. For several years, John Frost focused on his paintings and silkscreens. 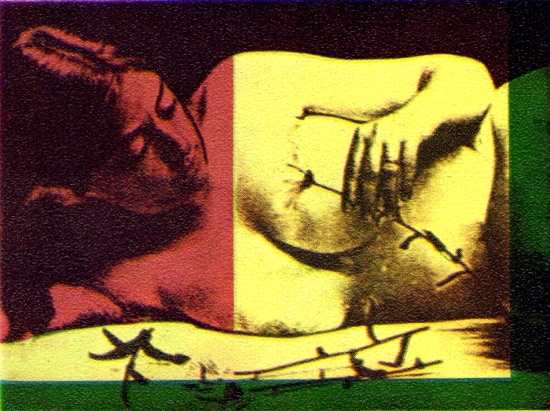 He worked closely, and shared his silkscreen techniques, with several other Jocotepec-based artists, including (Don) Shaw, Georg Rauch and Ra Rysiek Ledwon. Georg Rauch went on to experiment with his own silkscreen techniques using non-toxic materials, producing his own masterful silkscreens for many years. John also had a profound influence on the young painter Synnove Pettersen (1944-), who attributes her decision to return to doing silkscreen (serigraph) pieces at that stage in her career to his enthusiasm and encouragement. Starting in 1979, John Frost became the premier aerial photographer in western Mexico, amassing an impressive collection of images (now housed in the University of Colima), especially of the Lake Chapala region, the volcanoes of Colima and the rapidly developing mid-Pacific coast of Colima and Jalisco, including the area around Manzanillo. His aerial photographs have featured in several exhibitions, including four solo exhibitions in the state of Colima, three in the state capital and one on the university campus in Manzanillo. John Frost’s photos can be found in the collections of several Colima and Jalisco state agencies. A selection of his photographs graced the Guadalajara airport at the time of the 1986 World Cup, and his photos were exhibited in one of the lateral galleries of the Cabañas Cultural Institute in Guadalajara. This may have been the first time any Lakeside artist had ever been invited to exhibit in the Institute, arguably Jalisco’s single most important exhibition space. (Several years later, the Institute would invite fellow Jocotepec artist Georg Rauch to hold a retrospective of his work there, occupying the main galleries). Once, when chatting with me, John Frost remarked that “I never quite met my family’s expectations”. If that is really true, then I can only conclude that his family’s expectations were utterly impossible to meet, since John’s superb photographs and silkscreens, as well as his quiet encouragement of many other artists and photographers, speak for themselves. Arthur Burdett Frost (1851-1928) (ABF), was an early American illustrator, graphic artist, and comics writer. He was also well known as a painter. ABF’s work is well known for its dynamic representation of motion and sequence. ABF is considered one of the great illustrators in the “Golden Age of American Illustration”. ABF illustrated over 90 books, and produced hundreds of paintings; in addition to his work in illustrations, he is renowned for realistic hunting and shooting prints. Was sitting here looking at a 2’x2′ photo Mr. Frost gave me years ago in Manzanillo of Manzanillo harbor and wanted to thank him again. It is on my wall where I can see it all day long. Thank you Mr. John Frost! You photographed my father Marcelo Renteria. He was one of the locals in Chantepec Jalisco and he played soccer for River Plate. That photo means a lot to us since our father has also gone to heaven. Last week I visited El Chante and Jocotepec and your name was brought up by locals. Glad I found this page to thank you and your family for the photo and your talent.